Leiifiifi College has defended their title. Up against a fierce Avele College team, they won 33-23. It was the third round of the Zone A Secondary School 15s Competition and host, Leiifiifi College, has defended their title three weeks now. Avele College was hungry for a victory because they lost their previous match against an improved Vaimauga. Unfortunately, Leiifiifi College proved too good. Samoa College won by default against Anoama’a, while Vaimauga College defeated Palalaua College, 23-3. In the Under-17 competition, Avele College survived against Anoama’a, 12-10, to retain the shield. Leiifiifi defeated Falealili College, 28-3, while Vaimauga College scored an upset against Samoa College, 14-10. Samoa College Under-15 side claimed the Shield title after winning by default against shield holder for the past two weeks, Avele College. 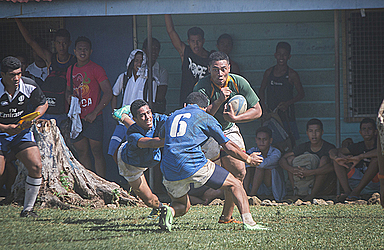 Another Under-15 match yesterday saw hosts Leiifiifi College defeating Vaimauga College 14-9 at fulltime. This week the Zone A Schools Shield holders are Samoa College, for the Under-15 competition, Avele College, for the Under-17 competition, and Leiifiifi College for the Under-19 competition.